All images courtesy of Beakerhead's generous Flickr account. Beakerhead 2015 is now officially underway here in Calgary, with four full days of intersecting art and engineering. Artists get (more) technical, engineers get (more) creative, and the rest of us get blown away. A city-wide celebration of learning, everyone is invited (gently, of course) to get involved. Entering its third year, the festival aims at encouraging youth to pursue both technical and creative endeavours, believing that creativity lives in the meeting point between the two. By incorporating elements of play and kinesthetic learning, the exhibitions inspire wonder and curiosity in people of all ages. It’s also a sign of Calgary’s continuing evolution. We’ve long been established as a hub of science and engineering in Canada, a benefit of being the nation’s energy centre. But the cultural renaissance we’ve experienced over the last five years has led to this reimagining of the cities strengths, unveiling a beautiful creative side of our city we often overlook. We’ll be heading down to check out the festivities today and tomorrow (check back later for a photo gallery), but we’ve compiled a short list of the exhibits that most excite us this year. Picking favourites was a painful process, with every item in the Beakerhead program bursting with fun and colour, but time is nobodies ally. Here’s what’s hot, and what’s free, down in the streets. Sept 19. 3:00 – 5:00 PM. FREE. Umbrella fights, but with Victorian era fashion. Steampunk, so you’re guaranteed to get your fill of purposeless cogs and gears. Recurring. 5:00 AM – 11:00 PM. FREE. That big giant with the colourful scales in the above picture, looming over the city near the Bow River. Product of Calgary’s glass-blowing masters Bee Kingdom, and the first AI inflatable headed to explore space. Recurring. 10:00 AM – 10:00 PM. FREE. Calgary is known for it’s wild, free-roaming rabbits. Now they’ve grown to gigantic proportions, begun to glow, and taken over the Central Memorial library park. 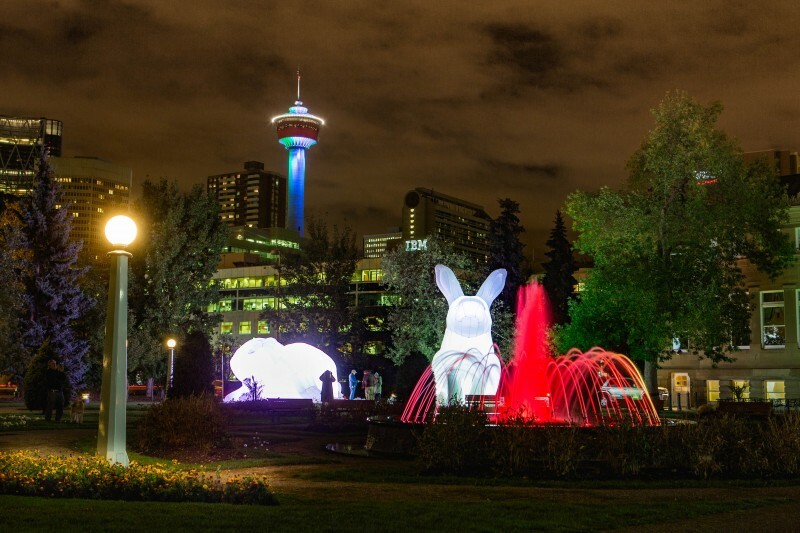 Four rabbits invaders are in our town (and a fifth hidden at Victoria Park), courtesy of Australian artist Amanda Parer. Recurring. 4:00 – 6:00 PM. FREE. 16 active stations and roaming art cars will turn four blocks of 8th avenue into a showcase for interactive stations. Included entirely on the strength of one station, Beakerhead’s Got Talent Dog Band, Pavlovian Rhapsody. Recurring. 6:30 – 8:30 PM. FREE. The Glenmore Water Treatment plant is a marvel of modern engineering, and the two-hour tours provided Wednesday and Thursday evening would open your eyes to just what you’re drinking. Courtesy of the City of Calgary. Sept 20th. 2:00 – 5:00 PM. FREE. Food trucks will here to serve you snacks while you watch teams compete to launch junk nobody wanted as far as their homemade catapults can. It’s open to the public, so start prepping your own designs for next year. Sept 20th. 1:00 – 4:00. $30. (1) Build an Atari 2600 synthesizer. No experience needed. (2) Slip it inside an Altoids tin. (4) Be the coolest person you know. Sept 19th. 3:00 – 4:00 PM. FREE. Ever watch a play and wonder “How the hell did they *do* that?” Alberta Theatre Projects opens their doors to show you the carpentry shop, the tech booth, and (best of all) the catwalk above the Martha Cohen theatre. Sept 19th. 10:00 AM – 5:00 PM. FREE. One part of the incredible A String (Theory) of Incredible Encounters series, this particular show will feature work from German artist Peter Willem Holden (eeee!) and Calgary artists Caitlind r.c. Brown and Wayne Garrett. This series is an example of art breathing new life into old Calgary, hosted in our shuttered historic Barron Building, now reborn as a stage for contemporary art. Sept 17th-18th. 8:00 – 8:45 PM. $15 + GST. Swallow-A-Bicycle theatre turns the experience of overhearing a conversation in a crowded cafe into a play, then perform it… in a cafe (without disrupting operations). Step into Cafe Blanca, grab a pair of headphones, and “accidentally” overhear the thoughts and troubles of the fascinating characters they’ve planted into the space. Or just order a coffee. But the show is there if you want it. Giant inflatable rabbits taking over our town. 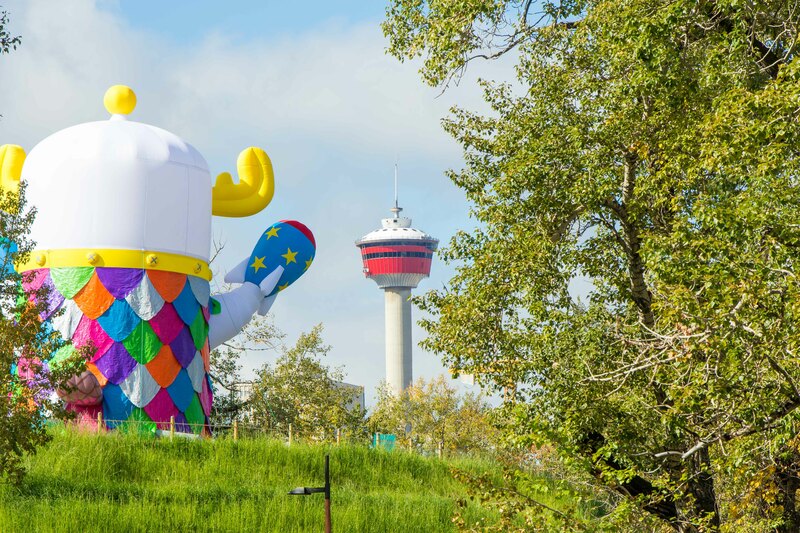 Beakerhead is running September 16th – 20th here in beautiful Calgary, Alberta. So come out and play Calgarians! You just might learn something. Can’t make it this year? Check out the Beakerhead website and show them some love. We want this carnival coming back, year after year.